The first preliminary fight of the night in UFC 136 pitted Jeremy “Little Heathen” Stephens (20-6-0) against Anthony “Showtime” Pettis – (11-2). 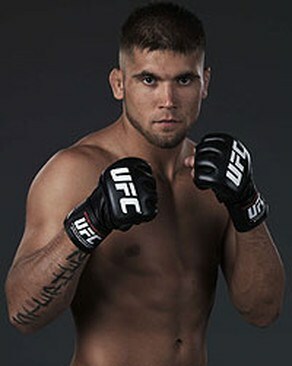 Stephens is a freestyle fighter who wants to bust up Pettis. He is one of the best one punch knock out artists in the lightweight division. Pettis is a showman who uses unique kicks and good hands to keep his opponents off guard. He is also good with submissions from his back. In round one, both fighters exchanged blows and kicks for the first minute. Eventually, Stephens bull rushes Pettis and gets a takedown, but Pettis uses his knees to push himself right back up. They continue to stand and fight, more defensively than offensively, until they get into a clinch with just under two minutes left. Stephens gets Pettis against the fence and eventually gets a takedown. As Pettis gets up and the fighters separate, Stephens throws a left-right-left combo, and connects with the right. With not much action, Stephens controls round one with two takedowns. Early in round two, Stephens moved aggressively towards Pettis, who lowered his body and got a double leg takedown. As Stephens pushed Pettis off from his back, Pettis stood up and landed a glancing blow to the nose of Stephens, causing the blood to start flowing. Pettis ended up getting two more takedowns, with Stephens getting back to his feet each time. Even though Stephens got to his feet after each takedown, Pettis would have him in a hold against the fence, and Stephens could not escape. With a minute left in the round, Pettis gets Stephens down and takes his back, looking for a rear naked choke. With just eight seconds left, and Pettis trying for an armbar, Stephens reverses position to gain top control. Stephens tries to land some heavy blows with Pettis on his back to end the round. Although Pettis is not inflicting much damage, he controlled Stephens the entire round. Stephens goes right after Pettis in round three. He fires off a couple of heavy blows to get Pettis backing up and set up his takedown. With Pettis on his back, he goes for a triangle choke off his back at 4:17, but Stephens postures up and they both get back to their feet. With Stephens moving forward again, Pettis ducks under a big right and goes for another double leg takedown. In the process, Pettis ends up on his back with Stephens standing over him. As Stephens steps in, Pettis uses his left leg, off his back, to sweep Stephens to the ground. They both get to their feet, and Pettis starts repeating what he did in round two. He controlled Stephens against the fence and got two takedowns. When Pettis goes for his third takedown, he ends up on his back and immediately goes for a triangle submission. Stephens briefly gets the back of Pettis, who steps forward with his left leg and walks out of the hold to get back to his feet. He immediately pushes Stephens right back to the fence with just over a minute remaining in the fight. Stephens reverses the hold and gets Pettis against the fence for a few seconds, and as they separate, the fight ends. Pettis ends up winning the fight with a split-decision victory. It was not an exciting fight, and there was not a lot of damage to either fighter, but Pettis controlled both rounds two and three, which was enough to win.